Adena was the 2000-acre estate of Thomas Worthington from 1773 to 1827. Thomas Worthington was the 6th governor of Ohio and one of the state's first United States Senators. The mansion house, completed in 1806-1807, has been restored to look much as it did when the Worthington family lived there, including many original Worthington family furnishings. One of the things you'll notice when visiting the house, that, despite its size, is that it is a comfortable house which is exactly what the Worthingtons wanted. Originally, the home was called Mount Prospect Hall up until around 1811. It was during this time that Thomas Worthington selected the name Adena from reading a book of ancient history. The word means places that are remarkable for their delightfulness. A true meaning of Worthington's estate. Thomas and his wife Eleanor, raised ten children on the Adena hilltop that overlooks the Scioto River Valley. The house has 20 rooms, three large halls and 16 fireplaces. The exterior walls are 22" thick and the ceilings are over 11' high. The house is one of only 3 houses designed by Benjamin Henry Latrobe still standing in the United States. Latrobe is considered the first professional American architect and served as architect of the US capitol under President Thomas Jefferson. Situated on the 300 remaining acres of the original home place are 5 outbuildings and formal gardens. The gardens have undergone major renovation. Visitors may stroll through three terraces of flowers and vegetables, as well as the shrubs and trees in the Grove. Looking east from the north lawn of the mansion, one can see across the Scioto River Valley to the Logan Range. This view is depicted on the Great Seal of the State of Ohio. In 1946, Elizabeth Fetterolf of Meadowbrook, Pennsylvania, gave the Adena sandstone mansion and surrounding 320 acres to the state of Ohio as requested by her parents, George Hunter Smith and Clara Smith, at the time of their death. George purchased the estate in 1903 after it had stood empty since 1896 when Martha Worthington, the last Worthington living on the grounds, died. At that time he lived in Chillicothe. After the purchase, the Smith's lived in the mansion during the summer months and the rest of the year in town. When Clara Smith died in 1946, she left in her will the desire that the mansion be given to Ohio, with the provision that the state would perpetually maintain it as a historical museum and memorials to her husband. That condition continues to be met as testifies a plaque stating that Adena State Memorial is a memorial to George Hunter Smith and Clara Boggs Smith. At the time of the transfer to the state, the mansion and property was appraised at $1,432,854.64. A new Museum and Education Center features interactive exhibits that use the stories of people connected to Adena to give visitors a picture of life in Ohio in the early 1800s as well as classrooms, meeting and rental space. The current restoration brings Adena closer to its original character as a prosperous estate of the early 19th Century. 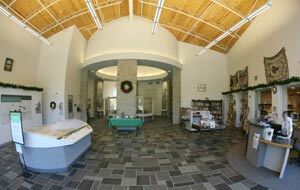 The Visitor and Museum Center offers a variety of artifacts as well as a gift store. Information from The Ohio Historical Society's extensive collection of Thomas Worthington's family papers were used to recreate Adena's appearance as it was around 1814 - 1818, the time that Worthington was governor of the state. The color and wallpapers used in the restoration were determined by new methods of historical paint analysis. Additional authenticity has been added by including several furniture pieces that actually were used by Thomas Worthington including the original grandfather clock that can be seen in the entry hall. Part of Adena's charm is the more than 4,000 flowering heirloom plants. Thomas Worthington enjoyed gardening and the gardens in place today represent some of the plants that Worthington may have had on his estate, including the vegetable garden, vineyard and orchard. Please Note: Tours of the mansion begin on the hour, from 10 am to 4 pm, with no tour at noon. The Ohio Historical Society restored the property and gardens and opened it to the public for the Ohio's sesquicentennial in 1953. Wednesday - Saturday 9:30 a.m. - 5:00 p.m.
Labor Day, Columbus Day) 12:00 - 5:00 p.m.
Adena Mansion & Gardens are operated by the Ohio Historical Society, a nonprofit organization serving as Ohio's partner in preserving and interpreting Ohio's history, archaeology and natural wonders. 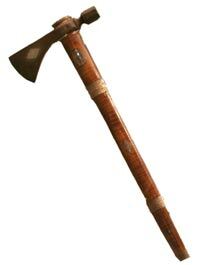 In the Visitor Center and Museum, is a ceremonial pipe shaped like a tomahawk that Tecumseh gave to Thomas Worthington in 1807 to recognize Worthington's efforts to promote peace between whites and Indians in Ohio. Thomas Worthington spent much of his time traveling throughout the state, but he also entertained a number of notable guests in his home. Here is a partial list of dignitaries: President James Monroe, General William Henry Harrison (future President), Governor DeWitt Clinton (New York Governor), Tecumseh, and Ohio Governors Edward Tiffin and Samuel Huntington. Thomas Worthington was born at his father's estate near present Charles Town, West Virginia (at that time it was Virginia) in 1773. Orphaned at seven, Thomas received little formal education and in his later years, Worthington wrote about his many trials as a youth in a memoir now in the collections of the Ohio Historical Society. At eighteen he went to sea for two years and then returned to the modest estate he had inherited from his father in Berkeley County. He engaged in farming, raising cattle, and surveying. In 1796, he made a trip to the Scioto River Valley in the Northwest Territory and determined to settle in the new community of Chillicothe. Wanting to settle his affairs back in Virginia Worthington headed back to his family's old homestead. While there he married Eleanor Swearingen. In 1798, Worthington and his brother-in-law Edward Tiffin brought their families and freed slaves to Chillicothe. In 1806, Worthington asked architect Benjamin Henry Latrobe, then working on the US capitol, to design a house for the Worthington family. Eventually called Adena, the home included large public rooms for entertaining and private spaces for the Worthington's growing family. Thomas and Eleanor Worthington eventually raised ten children at Adena. After his death in 1827, Eleanor remained at Adena until she died in 1848. The city of Worthington Ohio (a suburb of Columbus) was named in honor of Thomas Worthington. Adena has gone through several restorations in recent years. The first restoration from 1946 - 1953 was especially noteworthy for returning the house to its original floor plan. The second restoration from 1997 - 2003 brought to Adena new approaches, especially in finishes and decorations, based on new technology and sources. Born in England, Henry Latrobe immigrated to the United States in 1796. Latrobe served as Surveyor of Public Buildings in Washington, DC from 1803 - 1812 and again between 1815 - 1817.